In Lord of the Rings, Ents are described as being in form like trees – from sturdy, towering oaks to light birches and rowans – but nevertheless possessing wit, the ability to move, and hands to hold and craft objects. They live on ent-draughts of cool, clear water. As long-lived as Elves, Ents are an ‘unhasty’ folk, who consider their actions at length. Many have become so like normal trees that others cannot tell them apart. Once roused to anger, though, Ents are dangerous indeed, for they are immensely strong, able to tear down stone walls in the same way tree-roots often do, but in mere seconds instead of decades. They reserve their greatest hatred for those who wantonly burn trees or hew them with axes. By the Third Age of the Sun, the Ents were a dwindling race in Middle Earth. They were never numerous and no new young Entings came after the departure of the female Entwives, whose gardens were destroyed by the devices of the Enemy in the Second Age. Also, as in our world, the vast forests of Eriador where many Ents had once roamed had largely been hewed down or burnt, so that only a couple of small pockets remained. Apart from the great Entwood of Fangorn, realm of Treebeard, there was the Old Forest on the borders of the Shire. Here the black-hearted Old Man Willow dwelt by the banks of the River Withywindle. He held all the Old Forest in an enchantment by the power of his song, leading travellers to him, where with limb-lithe roots and branches he ended their lives. There were other savage tree-spirits like Old Man Willow, called Huorns, who dwelt in Fangorn, but there they were under the watchful eye of Treebeard and his Ents. ‘Ent’ is in fact a real Old English word, found relatively frequently in that language but its actual meaning is somewhat ambiguous. Its first association seems to be one of gigantic size: Ent is usually translated as ‘giant’. For example, the huge sword which Beowulf snatches up in Grendel’s mother’s lair is the work of Ents, enta aergeweorc. But Ents also seem to have had a reputation as builders in stone. Anglo-Saxons faced with Roman roads and Roman ruins were liable to describe them as orthanc enta geweorc, ‘the cunning work of giants’. Tolkien perhaps read the first word not as an adjective but as a name, so that the phrase now means ‘Orthanc, the ents’ fortress’ – which is what Tolkien’s Orthanc in the end becomes and might seem to later generations of men always to have been. However, the main point about Anglo-Saxon Ents is that whatever they were, they are felt to be no longer present, no longer a threat: they are present only in their surviving artefacts. Tolkien picked up the gigantism, the connection with the word or name Orthanc, and most of all the sense of extinction, for that is the fate of the Ents even more than of the other non-human peoples of Middle Earth. 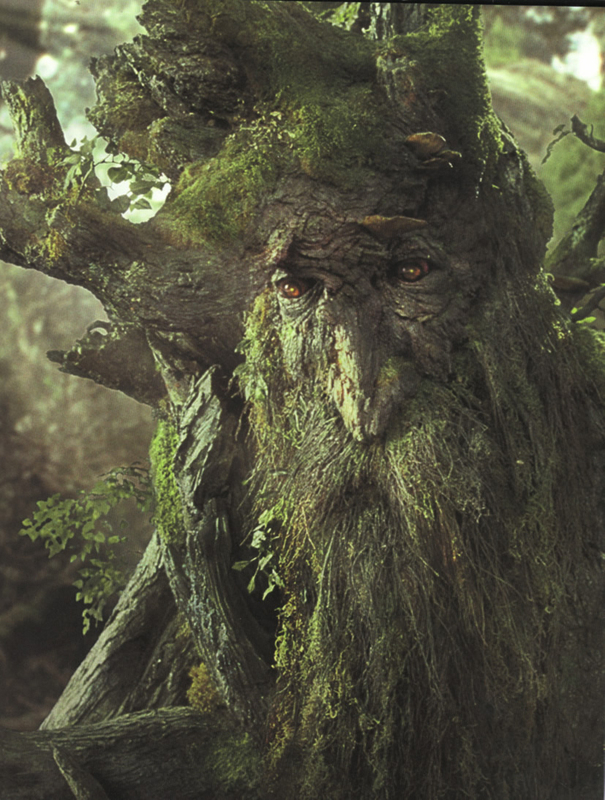 What came entirely from Tolkien’s own mind was the specific connection with trees – the idea of Ents as tree-herders, creatures which rise from and turn back into wood, as trolls do with stone. The motif of talking trees is one that recurs frequently in world folklore. In Ancient Greece Philostratus spoke about two philosophers arguing beneath an elm tree in Ethiopia which spoke up to add to the conversation. The Indian Tree of the Sun and the Moon (said to have been visited by Alexander the Great and Marco Polo, among others) told the future. Two parts of the tree trunk spoke depending on the time of day; in the daytime the tree spoke as a man and at night it spoke as a woman. In Celtic folklore Druids were said to be able to consult Oak trees for divinatory purposes (as were the Italian Strega with Rowan trees). After the publication of Lord of the Rings, the powerful image of the wrathful tree-men marching to war proved so popular that it has been copied many times since. The Wood comes alive to save the Narnians in the final battle of Prince Caspian, written by C S Lewis, a fellow member with Tolkien of the Oxford literary group known as the Inklings. Ent-inspired tree-creatures appear in the fantasy role-playing worlds of Warhammer, Warcraft and Dungeons & Dragons (re-named diplomatically as Tree-men, Treants or Woodskins for trademark reasons). There are even plans to erect a statue of Treebeard by Tim Tolkien, Tolkien’s great-nephew, near his former home in Moseley, Birmingham! It is possible that nearby Moseley Bog may have been one of the first places where the young J R R Tolkien regularly encountered trees of various species, and where his subsequent love of trees originally ‘grew’ from (if you’ll pardon the pun!). This is fascinating! (Also, trees! : -) Thank you for tracing these stories and images back to their, er, roots. I find it interesting that Tolkein figured his malevolent Willow as an “Old Man.” His more ancient (e.g., Celtic) sources linked the willow to a female deity. I suppose the servants and incarnations of far-back deities can take on the gender of that deity, or not. I’m fascinated by the idea of animated trees, and I hope they make that Treebeard statue. You’d think that, after the success of the Lord of the Rings movies, it would be a shoe-in. I’ve written before about animated trees in the Oz books. Great post 🙂 I read somewhere once that Tolkien partly based Treebeard’s mannerisms off his dear friend, C.S. Lewis. I truly enjoy reading your posts. Thank you for this. Wow, I am a member of the Tolkien Society at Oxford and am surprised I only now stumbled upon your blog this year! I found it researching Merlin, as my direct ancestry belongs to the Kings of Caerleon.